I love the tech tips -- I found Canva and Kunversion through Inman and use both platforms all the time as a team. Inman Select was launched to provide real estate agents and brokers with a reliable, specific source for the news and information they need to thrive in the real estate industry. And it’s helped hundreds of real estate professionals identify areas for improvement, plan and execute change and stay on top of rapid industry shifts as legal issues, technological advancements and consumer sentiment changes how business is done. We’re sharing the stories of real estate agents and brokers who read Inman Select and use it every day to improve their businesses. Here’s what they know that you might not. (Are you an Inman Select subscriber who’s interested in sharing how it supports your business? Email shawna@inman.com for the opportunity to be featured in upcoming Select Sound Bites). Jennifer Kennedy is a broker-owner in Alberta, Canada, who specializes in lifestyle marketing for the area. She’s been an Inman Select subscriber for at least two years and thinks Inman content is so high-quality that her brokerage makes the Inman Connect New York conference experience part of its top agent award. What is your greatest accomplishment in real estate? My greatest accomplishment is leading a thriving and growing, positive team! 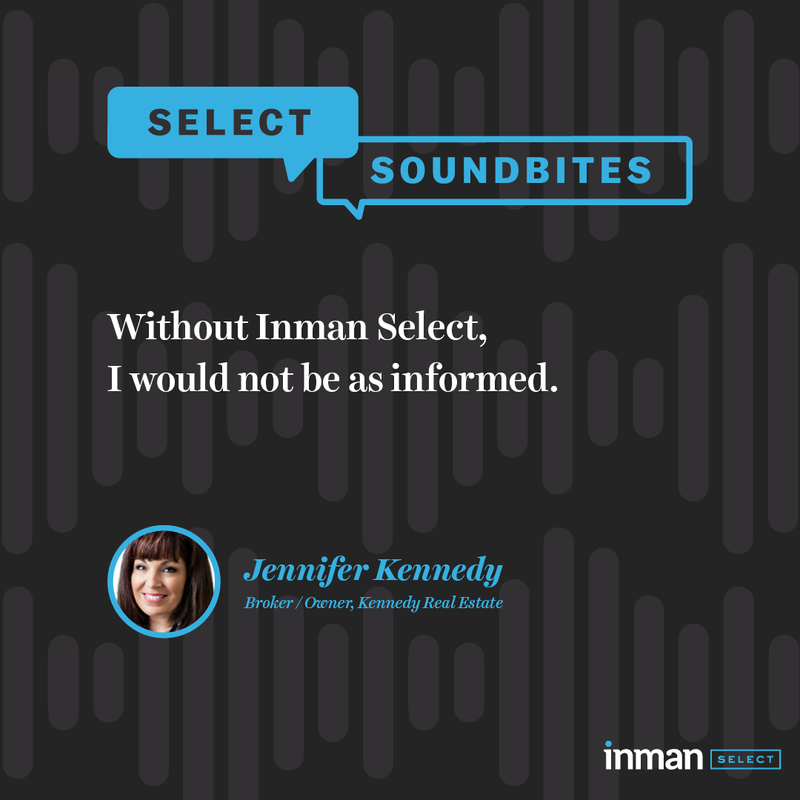 How do you use Inman Select in your real estate business? We love the tech tips — we found Canva and Kunversion through Inman and use both platforms all the time as a team. Inman Connect events inspired us to name our biggest real estate agent award for high performance “The Big Apple Award,” and we’ll send the winner to New York to attend the Inman Connect conference with an all-expense-paid trip starting in January 2019. The award will actually help grow the winner’s business, and he or she always wants to go back every year, growing our brokerage’s presence at the conference. And my husband and I get ideas like this all the time from following Inman Select and attending the conferences. What would you tell someone who’s unsure about the value of subscribing? Sometimes people don’t know what they are missing until they are given the opportunity to experience it. That’s how we feel about the Inman Connect conference experience for our brokerage and Inman Select. Not be as well-informed as it is today. Do you want to take your business to the next level? Subscribe to Inman Select today! Want to connect with Jennifer? You can find her online, YouTube and LinkedIn. Email Shawna Strayhorn, Director of Subscriber Growth, to share your Select Sound Bite!